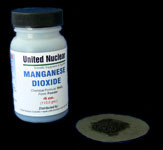 Manganese Dioxide is a widely used, powerful catalyst, speeding up a variety of chemical reactions. In a classical experiment of elementary chemistry, it is used to make pure Oxygen gas. The procedure consists of merely heating Potassium Chlorate and Manganese Dioxide together. It's mainly used in the manufacture of batteries. A piece of Zinc metal for an electrode, along with a paste made from Water, Manganese Dioxide and Ammonium Chloride makes the familiar dry cell battery.